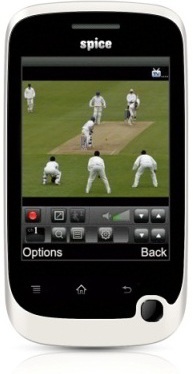 Spice FLO TV M-5600 is a touch screen dual-SIM phone, which allows you to watch Live TV. The handset is capable of receiving analog TV signals and does not require any data connection. Users can watch Doordarshan channels on-the-go. 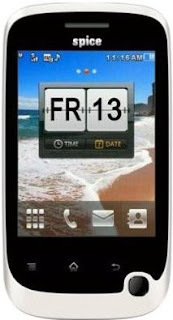 The Spice M-5600 features a 3.2-inch QVGA(240 x 320 Pixel) TFT Touchscreen display and sports a 1.3 MP rear camera. It has a dimension of 112.8 x 60.5 x 12.8 mm and weighs 110 gms. Connectivity and Expansion options of FLO TV M-5600 includes Bluetooth v2.1 with A2DP, USB v2.0, upto 8GB via microSD card. Colour options include Jet Black, Black+Blue and Ivory White. Other features of M-5600 includes FM radio with recording, Multi Format Video/Audio Player, Spice's S-Planet Apps store, Facebook and a 1200 mAH Li-Ion Battery which offers talk time of up to 6 hours and standby of 25 days. Spice M-5600 Flo comes with a price tag of Rs. 3,099. Tags:Spice M-5600, Spice M-5600 features, Spice M-5600 specifications, Spice M-5600 review, Spice M-5600 details, Spice M-5600 availability, Spice M-5600 specs, Spice M-5600 images, Spice M-5600 pics, Spice M-5600 pictures, Spice M-5600 price, Spice FLO TV M-5600, Spice M-5600 Flo, Spice FLO TV.